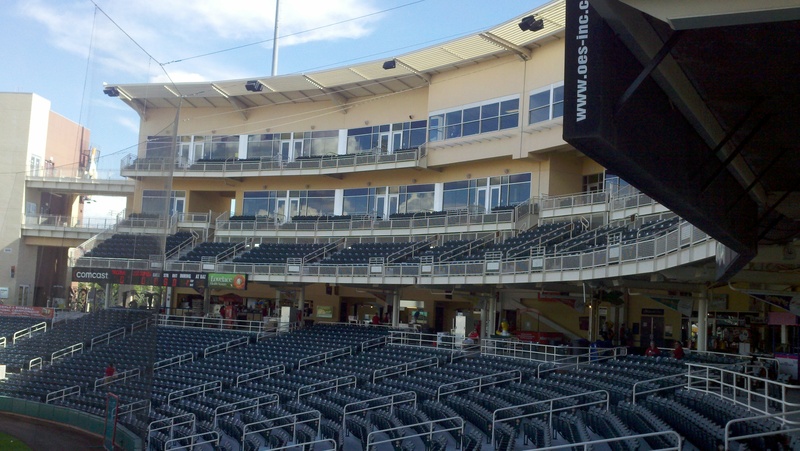 When the city of Albuquerque renovated old Sports Stadium to bring Triple-A baseball back to town in 2003, the new owners of the baseball team decided to name the club the Isotopes. This is a reference to an episode of The Simpsons, in which Homer goes on a hunger strike in order to save his beloved Springfield Isotopes from moving to Albuquerque. 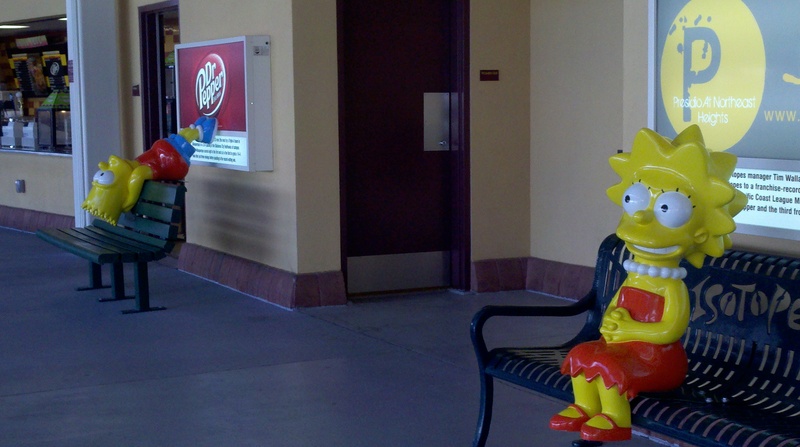 The Simpsons are quite visible at Isotopes Park. 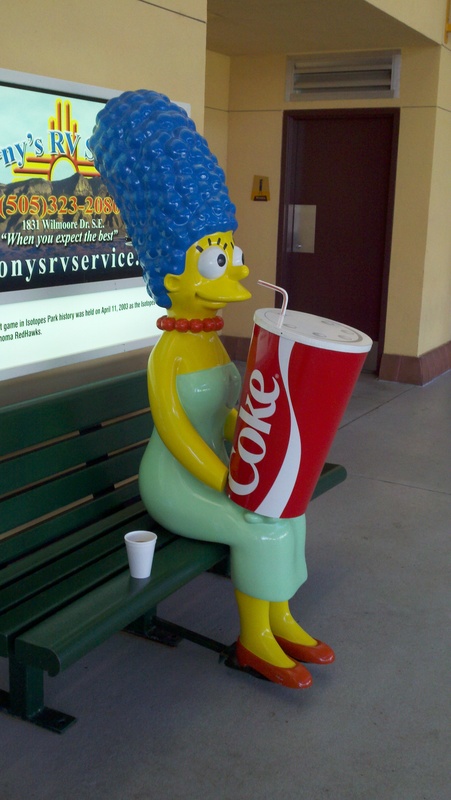 Marge has been super-sized. That's my coffee on the bench. You walk along the concourse, and they are everywhere. 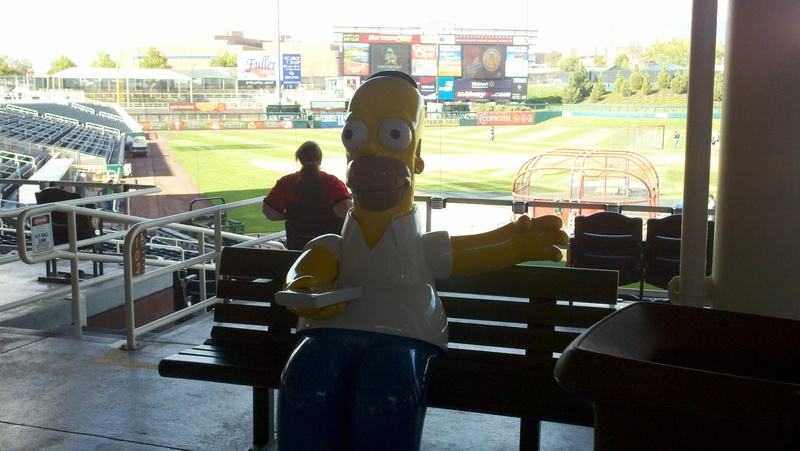 Fans can get their picture taken sitting next to Homer. You can click on these photos to enlarge them. 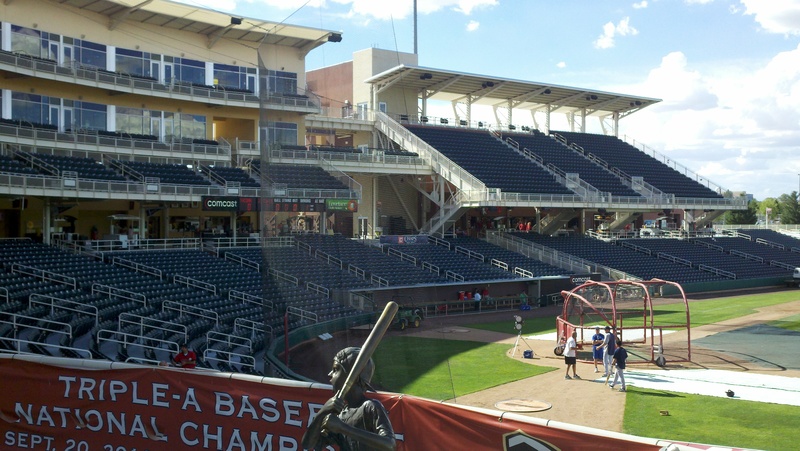 The ballpark itself is beautiful – easily one of the top three away stadiums in the PCL, with Memphis and Oklahoma City. View from the open concourse. 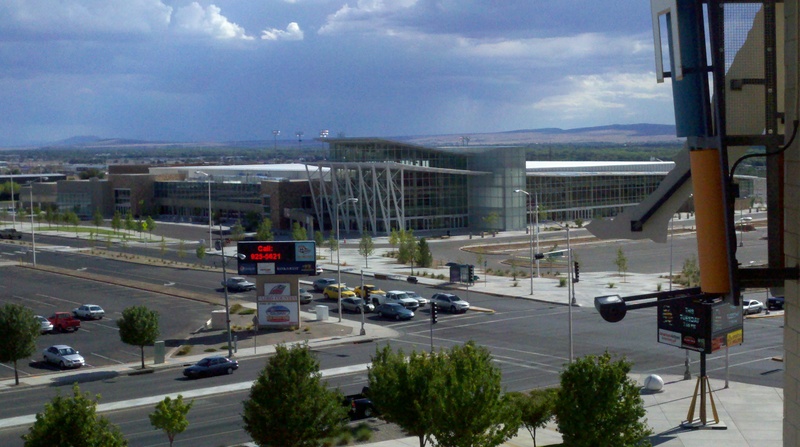 There are two levels of suites – my booth is on the top floor, and it’s one of the highest vantage points in the PCL. The concourse is covered by the suite levels. I think it's hilarious and we should copy them at Cheney. As an aside, they have a plaque honoring Orbit as the 2004 Pacific Coast League Mascot of the Year. Rhubarb? 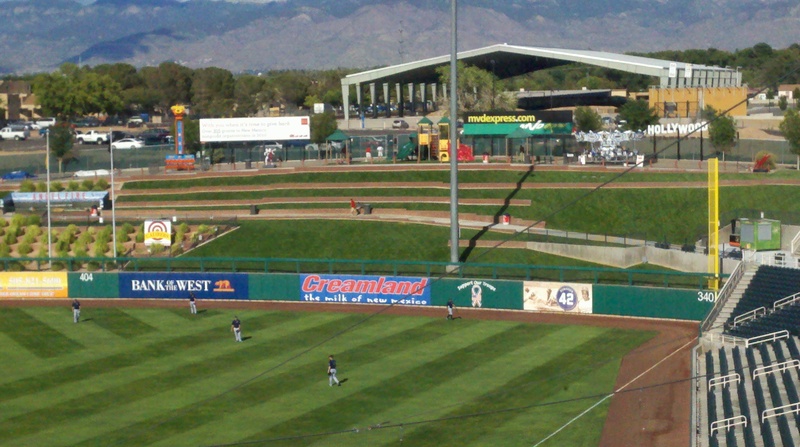 Isotopes Park is known for its hill in center field. The warning track is in front of the incline, and the fence sits several feet up the hill. 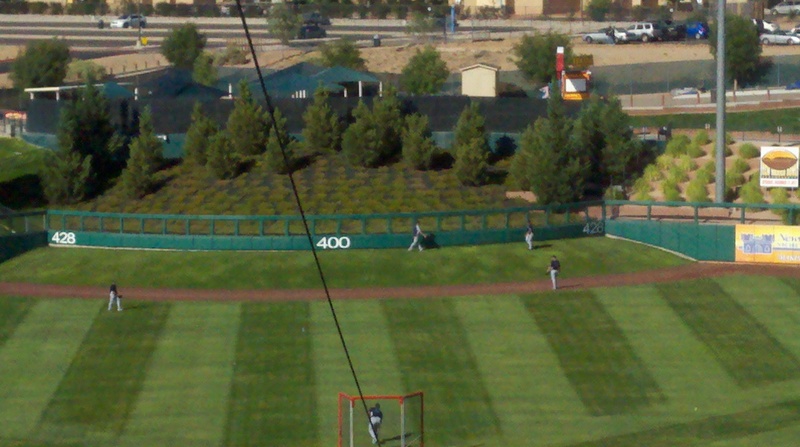 Wily Mo's home run on Thursday landed in the pine trees above the 400-foot sign. At old Sports Stadium, right field had the world’s only Drive-In seating section. Nowadays it’s a kid’s play area, with berm seating. The Hollywood sign is a nod to their Dodgers affiliation. 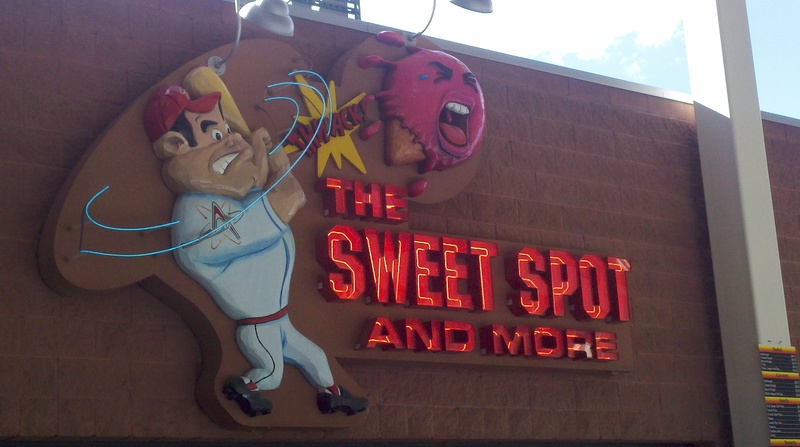 Check out this sign above an ice cream stand – I can imagine that this would scare little kids away! Right across the street from the ballpark is one of the most famous home courts in college basketball: The Pit, the home of the New Mexico Lobos. You don't want your team to schedule a road game here. On Friday night the Rainiers won their second game in a row, beating Albuquerque 13-9. Tacoma hit four homers in the game: Jose Yepez, Matt Tuiasosopo, Mike Wilson, and Carlos Peguero each went deep. Alex Liddi scored three more runs and he’s up to 103. The Rainiers reached the .500 mark at 57-57, and they remain 8.5 games behind first-place Reno with 30 to play. I maintain that if the Rainiers can pick up a couple more games before the four-game series at Reno on August 20, anything can happen. The Rainiers go for a series win tonight at 6:05 (Pacific).You can listen to the last game in Albuquerque on 850 AM and streaming online right here. Tacoma starts LHP Chris Seddon (7-5, 5.80) against Albuquerque RHP Francisco Felix (3-2, 5.96). Leading off, it’s the Rainiers game story from The News Tribune. Brush up on your Italian by checking out this blog item on Alex Liddi. The Mariners lost a tough 1-0 game in ten innings against one of baseball’s best pitchers. Trayvon Robinson had an interesting debut! Reno beat Memphis last night, 6-4, to keep the lead at 8.5 games. Wade Miley has been the Aces top pitcher lately. It took a trip to independent baseball for former major leaguer Drew Macias to appreciate Triple-A ball. Fresno defeated Iowa last night despite the hot bat of Cubs top prospect (and former Cal Bear) Brett Jackson. Rangers top prospect Martin Perez was dealing and Round Rock shut out Salt Lake, 2-0. Tacoma will face Perez on Wednesday. I think its kind of weird when fans pass the hat in Triple-A, but they do it in Round Rock. I understand it in A-ball… there is lots of good information about player salaries in this story. Nashville and Colorado Springs battled the rain again, but this time they finished before 1:00 AM. Nashville had 20 hits again. A guy named Cheney was Omaha’s 12 millionth fan. Jason Lane, the 34-year-old Las Vegas outfielder who pitched in blowouts against Tacoma, is seriously considering re-inventing himself as a pitcher. Toronto called up Brett Lawrie from Las Vegas and he had two hits in his debut. As a Canadian with the Blue Jays, he’s going to be enormously popular. Let’s see if the Rainiers can get a series win! 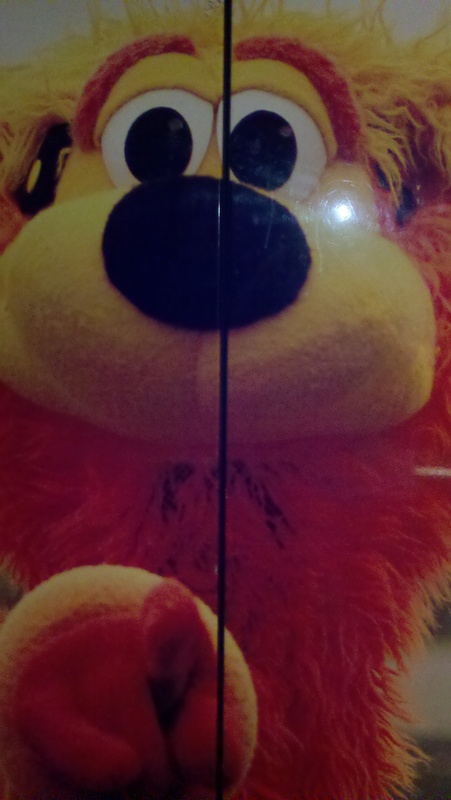 This entry was posted on Saturday, August 6th, 2011 at 10:49 am and is filed under Uncategorized. You can follow any responses to this entry through the RSS 2.0 feed. Both comments and pings are currently closed.